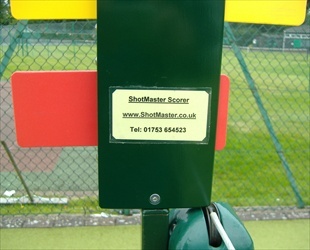 After seeing similar scoring devices at various clubs I have visited they were invariably broken or bent, I thought I could improve on them and make a more robust model. 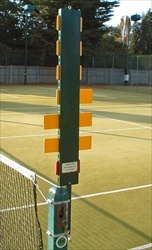 Highly visible, waterproof and sturdy, the yellow indicators just pull out to denote the games won, and the red indicator at the bottom for the sets won. 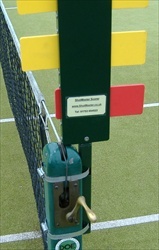 It revolves to point at the player/pair which has the designated score. 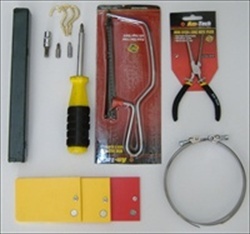 They come complete with a fixing toolkit to mount on the net posts, plus extra indicators in the event of breakage. 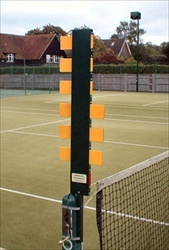 If you wish to mount these units on floodlight poles or on the steel angle posts that the side netting is fixed to, brackets can be custom made to suit, or a movable stand can be supplied if required. 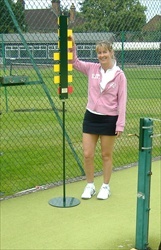 Each scorer has a brass ring at the top and a brass hook is supplied so they can be hung in your clubhouse if required. Just give me a ring to discuss, and I am always happy to discuss any questions you may have.